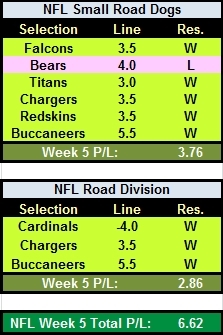 As promised, here are the results for this weekend from the NFL Small Road Dogs and Divisional Road Systems. A couple of selections featured in both systems, the San Diego Chargers getting 3.5 points at the Oakland Raiders, and the Monday night pick Tampa Bay Buccaneers who got 5.5 points at the Carolina Panthers. Eight winners from nine bets is about as good as it gets. Roll on Thursday! 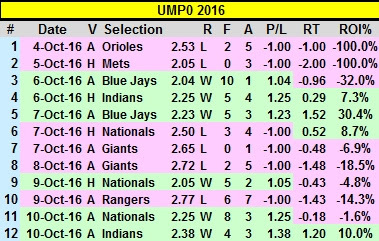 UMPO 2016 moved into the green again with two wins by the underdogs yesterday. I backed both the Nationals and Indians at 2.42, and mistakenly backed the Chicago Cubs at 2.24 assuming that they would be a certain UMPO qualifier at that price. However, my line source had the Cubs as odds-on (-103) and I laid off pre-game at 2.02 for a free bet. As I said yesterday, "Sometimes these line moves will work out for you, sometimes they won't." One thing I have noticed with Sharpe Ratio (SR) is that it is dependent on sample size. As sample size increases then all things being equal so does SR, which doesn't seem helpful to me. Try it with a spreadsheet. Have a set of yields that has the same average yield for 10, 20, 40, 80 and so on returns. You can achieve this with just two values and repeating throughout the samples. Then calculate the stdev for the 10, 20, 40, 80 and so on and then do the SR calculation for each. You will see a rising SR. I used to do an SR for daily yields and it was very low. Positive but low. I did weekly and it was higher, monthly higher still (over the magic 2.0) but I was still averaging the same yield. I still use SR in my optimisations but I have other metrics too and take all of them together. Some of you may remember that James wrote a post on this topic back in June 2012 - worth reading or re-reading. As James's example shows, the crucial thing with using Sharpe Ratio is understanding that the standard deviation (the denominator) is bigger for daily returns than it is for weekly returns, for weekly returns compared with monthly returns, and so on. Thus it is only useful when comparing like with like. It's not useful for comparing a short (small sample size) system with a longer term system. Also, to be extremely picky given that interest rates today are close to zero, but the Sharpe Ratio numerator isn't simply the average yield - it's actually the yield less the 'risk-free' rate, as James mentions in his post. I forgot to mention that the Sharpe Ratio I use is the ex-post version, which, unlike the ex-ante ratio, is based on realised returns and doesn't involve a risk-free rate.